As a way of saying thank you for being a loyal customer of Emerald Chinese Cuisine and Koi Bar & Lounge, we invite you to take part in a great journey of culinary experience and new heights of privilege. Join the Dragon Rewards program and use your membership to discover rewards, discounts, special offers, bonus points and fantastic surprises that you can enjoy when you visit. Become a member of the club in 2 minutes and you are automatically registered for the Dragon Rewards program. Present your membership card every time you dine or drink at Emerald Chinese Cuisine or Koi Bar & Lounge to earn back a reward redemption. Present your membership card when dining to enjoy special promotions and discounts. Use your points to enjoy more of the food and drinks you love at Emerald & Koi! After you hit a minimum of 200 points, simply present your membership card after to redeem your points and tell our staff you want to pay using your options. Once you use the points, they will automatically be deducted from your account. · Asking any of our team members for your balance by swiping your card or providing your phone number. You can redeem your points for discounts on your next dining bill. However, you cannot redeem your points for cash. Dragon Rewards is one way in which Seafood 168, Inc. endeavors to reward and thank loyal customers for patronizing our business. Members of Dragon Rewards are able to earn and accumulate points that can be redeemed for Dragon Rewards benefits, also known as “Rewards," at Emerald Chinese Cuisine and Koi Bar & Lounge. 1. Exclusive access to certain promotions and offers. Seafood 168, Inc. may offer Dragon Rewards members exclusive access to special menu items or discounts. 2. Personalized offers and coupons. Special offers may be distributed by email, or by physical mail. You must opt-in to receive promotional and marketing offers from Seafood 168, Inc. and may be required to provide a valid email, telephone and physical address in order to receive your special offers. Special offers may include periodic discounts on food, or the opportunity to earn “bonus" points. Special offers may have certain restrictions including expiration dates and short, time-limited redemption periods. Special offers are personal to you and cannot be shared, copied or transferred. 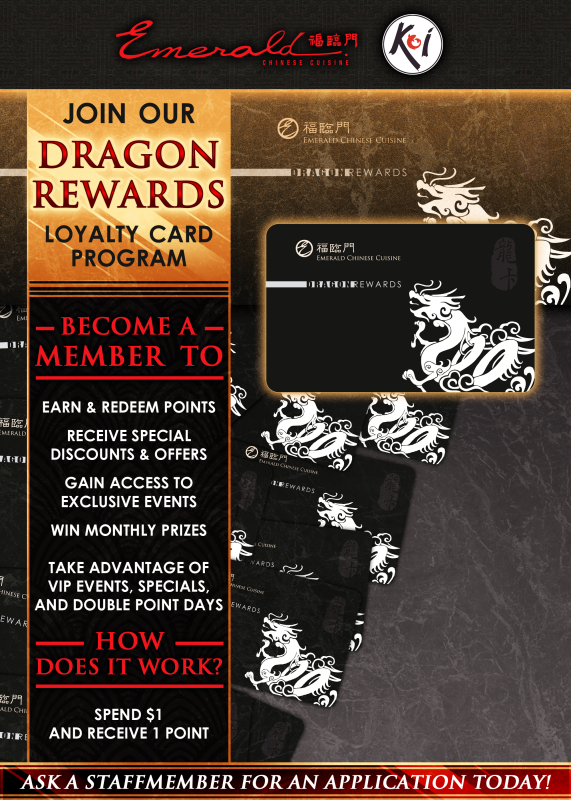 You may be required to present your registered Dragon Rewards Card in order to redeem special offers. Read each offer carefully for specific details, expiration dates, limitations and restrictions, and to learn when bonus points will be awarded to your account. 3. Double-Point Days: On designated Double-Point Days or Periods, the number of points you earn using your registered Dragons Reward Card will be multiplied by two (2). 4. Redemption: At a minimum of 200 points you accumulate, you will be eligible to receive a redemption reward off any future purchase at Participating Properties and may be redeemed only for a discount off purchase amounts equal to or greater than the sum of the reward presented for redemption. Redemption rewards are not transferable and may be used only by the member to whom issued. Only one member and their reward redemption can be used during a visit. Split bills between customers at a table is considered one visit. Redemption rewards have no cash value and no change will be given for reward redemption. There are no membership fees associated with Dragon Rewards. Points accumulated under the program are promotional and have no cash value. Your points, Rewards, registered Dragon Rewards Cards, and your account under Dragon Rewards are personal to you and may not be sold, transferred or assigned to, or shared with, family, friends or others, or used by you for any commercial purpose. You may have only one (1) Dragon Rewards account that is personal to you. Without notice to you, Seafood 168, Inc. also reserves the right to “unregister" and make ineligible for the Dragon Rewards any account that has been inactive for one (1) consecutive years. Inactive is defined as no points earned. In the event that your account is unregistered or rendered inactive, then all accumulated points in your account are void. Seafood 168, Inc. reserves the right to terminate, discontinue or cancel the Dragon Rewards program at any time and in its sole discretion without notice to you.